The Glock 21 Gen 3 is a proven work horse for many police departments around the world. With the powerful 45 ACP and the reputation for the most reliable handgun you are at a clear advantage with the Glock 21. I am a member of Law Enforcement as well as a big-time Glock and 45 fan. I love my glock21. I have a shot a thousand rounds already. This is my new firearm for work. 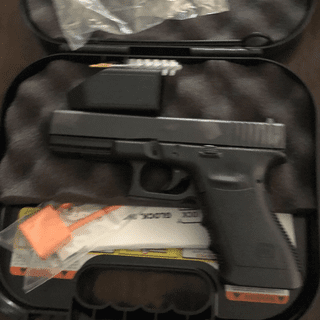 This is the very first Glock that I own and I must say I'm impressed with the quality of this gun. I fired 100 rds right out of the box with no issues nor malfunctions. Truly an excellent weapon. Service from Grabagun was superb. Completely superb experience all around. I own several Glocks and this is my carry gun. I love 1911s too but the Glock 21 has twice the fire power and the ability to digest any ammo and not malfunction. I have had an occasional 1911 malfunction but not Glock with thousands of rounds through both. Good accuracy out of the box also.